I frequently wonder how many subscribers of The Rafu are not of Japanese ancestry, especially when I receive letters from readers with “Caucasian” names. An example is the following I received from a reader, Howard Lee Kilby, who lives in Hot Springs, Arkansas. That’s right, Hot Springs, Arkansas. I wonder how many of the population of Hot Springs are Japanese Americans? “Dear Mr. Yoshinaga, please don’t ever stop writing your column. I’m only one of thousands who enjoy your writing. “By the way, I plan on visiting my son and his family in Los Angeles September 2-9. I’d enjoy taking you and your wife to lunch or dinner. I’d even consider driving you to Las Vegas for the weekend. Not sure if my son’s itinerary will work out at this point but meeting you will be a highlight of the trip. “I attended the Hot Springs Buddhist Society meeting this morning. The group has met for two years every Saturday morning in Hot Springs National Park, Arkansas. I visited a Buddhist friend in hospital afterwards. It occurred to me that there isn’t a Buddhist chaplain in the hospital here. “Then I received an email from an attractive lady with her telephone number asking about Buddhism. Thanks for your letter, Howard. I enjoy getting mail from readers scattered all over the country. Kind of gives me an idea of what’s going on in the U.S. outside of the Los Angeles area. It might be interesting to do some research at The Rafu to find out how many states in the U.S. have Rafu subscribers and heck, I wouldn’t be surprised if we even have subscribers in Japan. I know when I lived and worked in Japan in the early 1960s, I used to get copies of The Kashu Mainichi, where I worked before going to Japan, mailed to me. Of course, most of the copies were over a week late, but I was still able to keep up with what was going on in Little Tokyo. Yeah, I guess I missed living in Ellay’s J-Town while I was residing in Japan. I know my wife wanted to return to the U.S. after two years, but we lived in Tokyo for three years. The passing away of the person who hired me to work at his firm in Tokyo ended my stay there. If he had not passed away, who knows, I might still be living there and my wife might have jumped on a plane and returned to Gardena with our three kids. Of course, I would have been on the next flight back to Los Angeles. I guess a friend of mine is getting concerned about my not traveling to Vegas these days. I told him he didn’t have to do that. But he said he has already reserved one night next Saturday, so I guess I’ll be going with him. Maybe I should have asked him to drive me to Vegas instead. A list of the top ten restaurants in the Los Angeles area was published recently. Would you guess that the top choice in the rating was a Japanese food place? It’s named Asanebo and it’s located in Studio City. I guess one of these days I’ll give it a try to see what makes it the top eatery in the Los Angeles area. Yeah, it’s probably an expensive place, but we’ll see. Where do you think the longest-living place on Earth might be? Well, for your information, it’s Nagano Prefecture in Japan. The size of Nagano Prefecture is 5,245 square miles, almost the size of the State of Connecticut, with a population of 2.15 million. Nagano Prefecture has the number one life expectancy, employment rate for those 65 and over, and vegetable consumption per capita. Women in Nagano Prefecture can expect to live an average of 87.2 years. Men can expect to live 80.9 years. Life expectancy in Connecticut is 78.6 years for men and 82.9 for women. Hawaii has the highest life expectancy in the U.S., 78 for men and 84.7 for women. Tucked high in the Japanese Alps, Nagano experiences long and harsh winters. For generations, people ate tsukemono to make up for the lack of fresh vegetables. The high salt content of tsukemono was blamed for Nagano becoming number one in strokes in 1981. Changes in the diet since then have resulted in today’s high life expectancy. I would guess that there are only a very few Nisei who can say this: “I don’t play golf. ” And I am one of those who can make that statement. The reason I don’t play the game is that a long time ago when Japanese Americans returned from the evacuation during WWII, many took up the game of golf and the site of their participation was the Monterey Park Golf Course. So I did, and while I still enjoy watching others play, I have no desire left in me to learn the game. When Michelle Wie won the women’s tournament this past weekend, I guess I was as thrilled with her victory as her most rabid fans. I hope she can continue to win and become one of women’s golf’s top stars. She has the ability to do so. I guess on the men’s side, Japanese American golfers didn’t have the player to match Michelle’s skills. Hopefully, there will be a Sansei or Yonsei who will take up the game and begin to match Michelle’s success. Golf does take a certain amount of mental conditioning. Something I didn’t possess when I began playing the game back in the late ’40s. Everyone knows I’m a hamburger fan, especially Burger King. Well, I was happy to read in a promotional flyer that Burger King is now going to deliver takeout orders. So the next time I’m thinking of getting takeout, I can get Burger King delivered to my home instead of having to go and wait in line at one of their restaurants. I guess what this means is that instead of a bowl of noodles, I can enjoy a Burger King sandwich at home. I’m glad that The Rafu, in its last Wednesday edition, ran a story on Don Miyada, who received his belated high school diploma from Newport Beach High School. 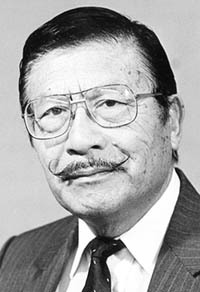 Miyada was denied his diploma back in 1942 because Japanese Americans were sent to relocation camps and not given the opportunity to graduate with their classes in California. I can understand his position because I was in the same situation. So when California passed a new law on JAs getting their diplomas, I was among those who benefited, just as Miyada did recently. Mountain View High School in Northern California presented me and two other JA classmates with our diplomas a few years ago at a regular prep graduation program. The Mountain View Register, the newspaper that serves the area, gave us a front-page story just as The Rafu did for Miyada. Needless to say, I bought a dozen copies of the newspaper to pass out to those who didn’t know about the receiving of our belated diplomas. I’m glad the people at Mountain View High knew that I had resettled in the Los Angeles area after my return from serving in the U.S. Army. Otherwise I might have been left out of the ceremony. Well, I guess I can wind it up for today. Sorry, I may be a little shorter than my usual column. Hopefully, I can keep it going, but you know how it is. How many guys my age, who have been hanging around the vernacular journalism field, are still around?